Above: BB Couture Polishes that 2 lucky winners of the Body & Soul June Contest will win! L-R: Dragon's Breath, Balboa Beach Bunny, Midnight Malibu, Sea of Cortez, Frosty Meadow, Laguna Lagoon. Click picture for added detail. 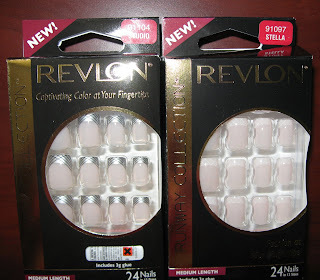 Above & Below: Revlon Products I'll be reviewing later this month. Hello! I hope you're all enjoying your Saturday. I have now received all of the BB Couture Polishes that will be part of the prize for the Body & Soul June Contest (see JUNE CONTEST in upper right corner if you're interested in the details), so since my nails are naked, I thought I'd share a picture of these with you instead. My Nubar order is due Monday, so once that arrives, I'll pose everything together and take a new picture for you. Don't forget that the Overall Beauty special for BB Couture polishes ends tonight at midnight. See details for that offer in the 'Tip Jar' column to the right (up to 3 free for Body & Soul readers vs. 2 free for all others!). 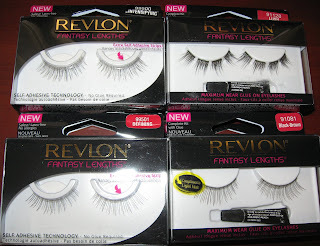 I also received a box of false eyelashes and false fingernails from Pacific World Corporation who holds the license to the Revlon name in their false eyelash and nail line. So I'll be reviewing those and sharing my thoughts sometime later in the month. They sent me 2 of everything (so 4 nail kits and 8 eyelash kits), and I imagine that's because they expect me to screw up the application, because I'm not that well-versed in these types of products! But I'm excited to try them out, so I'll see how well I can apply them. Nice prizes Mary! I hope you show us when you get those eyelashes on. I like those nails. Pretty. Have a nice weekend. You've got some nice things for the winner! Good! you deserve free stuff for all your hard work swatching and then posting all these beautiful photos for us. All the BB's you have shown look so lovely. Keep up all your good work! Missy~these look pretty to me so I'm anxious to try them out and see how they wear. Tuli~thanks, I'm glad everyone seems to like them. I love BB polishes, they're really top quality. Lucy~if I can get them applied, the nails AND the lashes! ), I'll certainly share them. Vanessa~Do you have any of these polishes yet? They have great colors and very different finishes. Enter now so you have more chances to win! Happy early Birthday! Deez~Thaks for the kind comments. BB makes so many great colors. Celine~glad you like them :) It's fun for me, so I'm glad everyone else enjoys it, also.